Arab MK Ahmed Tibi (United Arab List) has followed in the footsteps of MK Hanin Zoabi (Balad), who insisted that those who abducted the three Israeli teens on June 12 were "not terrorists." Like Zoabi, Tibi on Monday in an interview with host Sharon Gal on Radio Tel Aviv 102fm refused to apply the term to the Hamas terrorists who abducted and murdered Naftali Frenkel, Gilad Sha'ar and Eyal Yifrah. Tibi began saying "I blame the government of Israel, Naftali Bennett and the rabbis who incited to murder Palestinians," accusing Israel for the murder of Mohammed Abu Khder, the 16-year-old from Jerusalem's Beit Hanina neighborhood who was found burned to death last Wednesday. Police arrested six Jewish suspects on suspicion of involvement in the murder on Sunday, with three of them reportedly breaking down under investigation and confessing to committing the murder. Lawyers initially said police have had trouble gathering evidence connecting the six to the murder that sparked days of violent Arab riots, encouraged by Abu Khder's mother who last Friday called for violent "revenge" against Israelis. Radio host Sharon Gal said to Tibi in the heated interview "I say to you that the murderers of Mohammed Abu Khder are terrorists. Are the murderers of the Israeli youths terrorists?" Tibi attempted to avoid the question by talking about "the national struggle," at which Gal said "I didn't ask about the struggle, why are you avoiding? You can't tell me that they're terrorists and end this debate?" "I won't say what you want me to!" retorted Tibi, to which he was asked "why? Because they're martyr peace fighters in your eyes? I don't understand." "It may be that you're an idiot"
The Arab MK then told the radio host to check a statement that his United Arab List party released, and when asked for his own statement based on his own morals, Tibi claimed "I said my opinion in a clear, unequivocal denouncement." In that "denouncement" at the Knesset podium, Tibi noted the "tragic end" of the abduction before decrying the IDF operation rescue mission and then going berserk after he ran out of time to speak. "I didn't understand the denouncement!" stated Gal. "I asked if they were terrorists." At that point Tibi insulted the radio host, saying "it may be that you're an idiot," to which Gal responded "it may be that you're insolent," to which Tibi said "the interview is over" and hung up. Speaking to Yedioth Aharonoth on Monday, Tibi addressed the widespread violent Arab riots which have been raging since the murder last Wednesday, and which seen rioters attack police and Jewish residents, and inflicting great damage in Jerusalem including the destruction of three Light Rail stations. "There's no symmetry between one who rules and one who is ruled, between one who occupies and one who is occupied, between a lone government and a minority that feels oppressed, is enraged and wants to oppose," Tibi asserted. Two weeks ago Tibi spoke to Hamas's Palestine magazine, alleging that the organization is "not a terror organization." 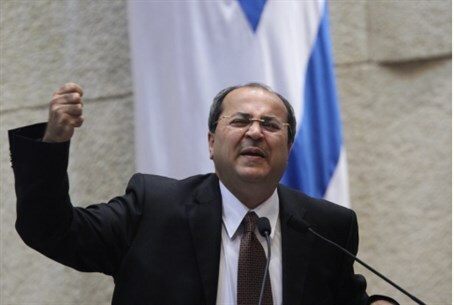 Making Tibi's comments more serious is the fact the he currently holds the post of Deputy Chairperson of the Knesset, a position he has been accused of abusing to shut out political opponents. The Arab MK's comments are reminiscent of those of Zoabi, who as noted said the Hamas terrorists who abducted the three teens "are not terrorists," and that the kidnapping is a "last resort" for Palestinian Arabs frustrated by their lives. Zoabi remained defiant in the face of criticism over her inflammatory statements, claiming "I did not break any laws. On the contrary - I am fulfilling my moral, human and political duty, the obligation for which I was sent to the Knesset: to fight oppression, and for justice."